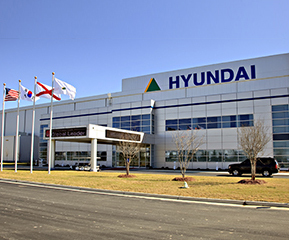 Montgomery, AL - April 17, 2018 - Hyundai Power Transformers USA, Inc. (HPT) has announced a $33 million expansion of its Montgomery facility resulting in the creation of 86 new jobs. The expansion will enable the company to establish a "Smart Factory" and increase production of its power transformers by more than 60 percent. The expansion will include a newly-constructed training facility that will contribute to fostering an advanced labor force, taking the company one step closer to achieving its plan of generating $200 million in revenue by 2021. HPT is Korea's first production plant established in the U.S. within the electric power industry. It currently employs 300 people and can produce 14,000 MVA annually, or 80 units of power transformers. According to Goulden Report, a market research provider of electrical industry, United States (12.71 percent) was the second largest transformers market after China (34.57 percent) in 2016. Officials in HE disclosed that they will add additional sales labor force in HPT and reinforce its sales infrastructure, in preparation for future business portfolio diversification- expanding its market exposure to high voltage circuit breakers, rotary machines, power distributors, and energy solutions. The expansion of HPT will bring 86 additional jobs to Montgomery. Those interested in applying can email recruit@hhiamerica.com.